With the news of Bomberman returning to gaming with a brand-new Nintendo Switch exclusive entry in the series, SuperPhillip Central decided to celebrate with a look back at one of the White Bomber's GameCube adventures. 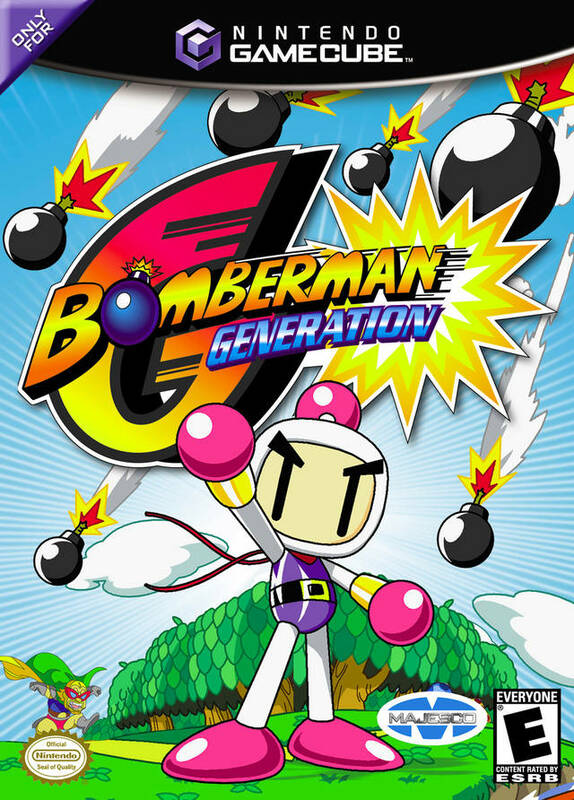 It's Bomberman Generation, and here's my retro review of the game! Does whatever a Bomber can. Bomberman Generation's story mode follows the destruction of a vessel that was transporting the six Bomb Elements through space. The HIGE HIGE Bandits are behind the destruction and subsequent theft, and it's up to Bomberman to track the Bomb Elements down, nab them from the HIGE HIGE Bandits, and save the universe once more. Dialogue in Bomberman Generation is fully voiced, and Bomberman will repeatedly get stopped mid-game by Professor Ein who generally has something obvious to say about what you need to do next in a given level. Thankfully, these interruptions only happen the first time through a level. Meanwhile, during boss stages you have to suffer through the introductions of each boss with no means to skip them, even if you've already taken them down before, which can become quite vexing. 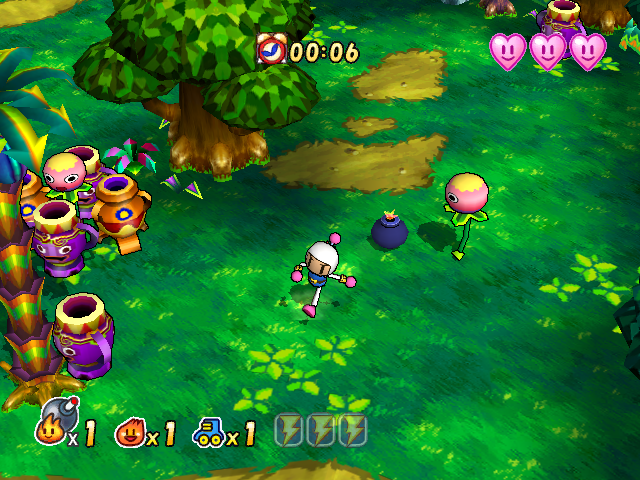 Generation plays similarly to previous 3D entries in the Bomberman franchise, such as 64 and its now rare and valuable sequel, The Second Attack. It plays with an overhead, slightly isometric view, where you have full control of the camera, being able to turn it with the GameCube's shoulder buttons. Occasionally, however, especially in enclosed areas, it can be difficult to get the right angle on the action, though this problem doesn't occur often. Bomberman begins with a limited amount of firepower and bombs available to him. Only through bombing specific objects do firepower power-ups that expand the range of his bombs' explosions, roller skate power-ups that speed Bomberman's movement, and bomb power-ups that add more bombs that Bomberman can summon on screen at the same time appear. Starting off, you're limited in how you can defeat enemies. You can kick a bomb into an enemy, but they'll recover faster than your bomb will explode. As you get more bombs and more firepower, it's much easier to take out enemies. Otherwise, hitting enemies is rather hard when starting the game, requiring an annoying sense of timing and strategy. Unfortunately, if Bomberman loses all of his health, when you begin the level again, all your firepower, movement, and bomb boosts are removed. This makes some boss battles near impossible due to how sluggish Bomberman moves, making it challenging to avoid their attacks. 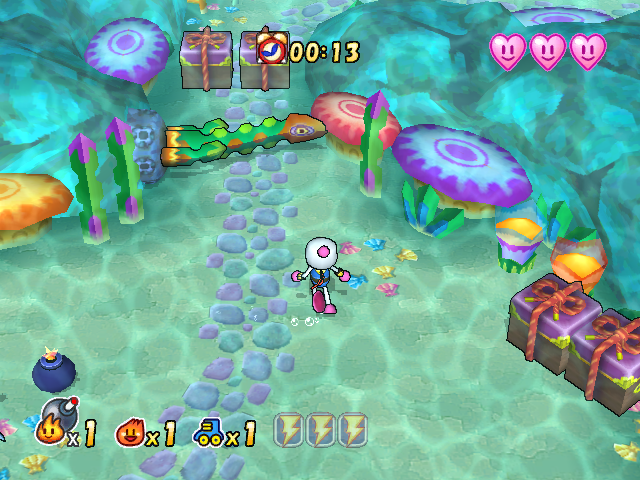 Starting off, Bomberman is slow and makes it challenging to hit enemies. There are five major areas in Bomberman Generation, and each possesses 4-6 levels each. Levels consist of using bombs to not only take out enemies, but also to interact with the environment to solve simple to complex puzzles. You start off in the first world doing easy things like bombing trees to have them fall over, creating bridges, as well as bombing boulders that block the passage of water in order to create flowing rivers. Later in the game you're shifting giant sheets of ice with big bombs to strategically pass around and even through them. Water you thinking entering the ocean without some water bombs, Bomberman?! Through Bomberman's adventure he'll come across various portals, some out in the open and some requiring some form of careful exploration to find them. Some of these portals have mini-games that when won give Bomberman a material that can be used to fuse new types of bombs, such as water bombs that are the only bombs that can explode underwater or ice bombs that freeze geysers that Bomberman can then cross. Other portals contain Charaboms, a series of creatures no doubt inspired by Nintendo's Pokemon. Your first Charabom is given to you automatically. Every other one requires you to battle them. Battles are somewhat luck-based, requiring each side to choose from one of six orders of moves (attack, defense, and special attack) to take down their opponent. The early battles against Charaboms are the most challenging, as later in the game you get the ability to fuse Charaboms together. This makes them immensely strong and able to steamroll most Charabombs you battle regardless of your luck and what order of moves you choose. Charaboms aren't just for battling and collecting. When equipped to Bomberman, each gives him a special ability. Some give Bomberman maximum firepower from his bombs regardless of how many firepower pick-ups he's collected. Others give him the ability to detonate his bombs at will with the press of a button, allow him the ability to bounce off bombs to cross certain chasms (a great thing to have as Bomberman can't jump), or give him the ability to set a bomb and control its movement until it explodes. Fused Charaboms give a combination of abilities depending on Charaboms fused. Possessing elemental bombs and different Charaboms is important to fully explore every level in Generation. Bomberman can discover a whole slew of interesting things in the game such as heart containers that add a heart to his health as well as Lightning Cards that unlock a special bonus when all of them have been collected. Both of these not only require careful exploration of levels, but they're a lot of fun to find and figure out how to collect. 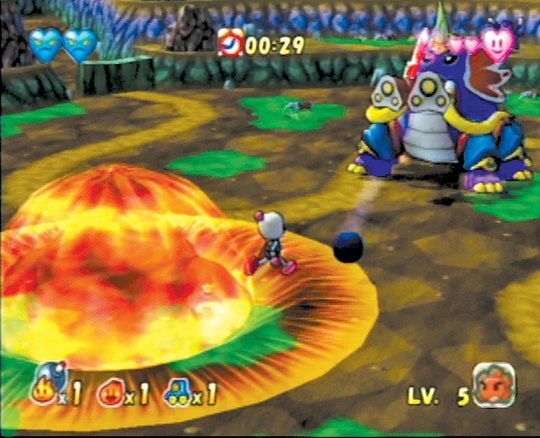 The halfway point and last level of each world of Bomberman Generation pits Bomberman against a boss of some type. The halfway point boss is part of a special force of bombers associated with the HIGE HIGE Bandits known as the Crush Bombers, who each have their own distinct powers and personalities. The final level boss is a more difficult opponent if only because some of these encounters make it difficult to know when that boss is vulnerable to a bomb attack. I spent several minutes and lives on some bosses just due to the fact that I didn't know when the boss could be damaged. Despite the initial frustration, I eventually figured it out and went on my merry way in Bomberman's adventure. This mammoth boss concludes the first world in Bomberman Generation. Bomberman Generation's story mode is enjoyable, and it doesn't outwear its welcome either. It's a breeze to play as it's not too terribly challenging, but going for all the Lightning Cards, especially from the Crush Bombers where you need to perform specific tasks during the battle to earn their five cards, makes for a greater challenge. And even if you don't find yourself enjoying the story mode (which would blow my mind as it's quite good), then there is the tried and true multiplayer modes to sink your teeth into. Multiplayer offers a variety of modes, maps, and options to make for many sleepless nights of local partying fun. Whether it's traditional deathmatches, a mode where you use bomb explosions to flip tiles in order to have your color appear most on the map before time runs out, a mode where you avoid falling bombs, and much more, there is a lot of entertainment to be found here. 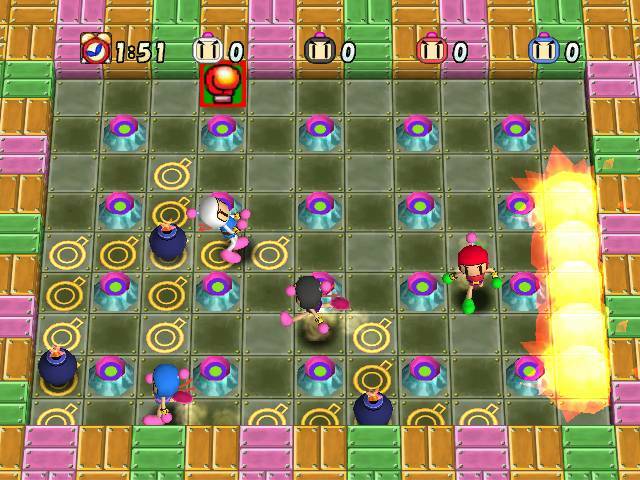 If you're looking for traditional Bomberman multiplayer action, you've got it in Bomberman Generation. Bomberman Generation sports a lovely cel-shaded art style, though to be fair, I am sucker for this visual style. Characters look great in their cel-shaded glory, though the environments could be a bit more detailed. That said, there are no frame-rate issues to speak of, perhaps because of the aforementioned lesser detail of the environments. The voice work stretches from decent like Professor Ein to comically bad. Meanwhile the music delivers catchy melodies fitting for each level and boss it plays during. Overall, Bomberman Generation is a blast. (Hey, I could have gone with "it's the bomb" so go easy on me.) With a highly engaging single player component and the tried and true multiplayer mode that offers some of the most fun in the series this way of the Sega Saturn's Bomberman, Generation delivers an explosive package worthy of playing. The inability to skip cutscenes and Bomberman's sluggishness at the beginning of each life make for some slight annoyances, but all in all, this version of Bomberman blows the competition away.